Fantasy Sports are a huge part of the sports industry in the United States. Various estimates I read value the industry at $2-5 billion per year. Most of that is advertising revenue on the various fantasy sports websites. Fantasy sports have also taken off in Australia over the past few years as the US craze spreads internationally. So I got to thinking about how churches could use fantasy sports that so many of our male members are involved in as an evangelistic tool. I can't believe this is a real thing!!!!!!! Australia may be a bit slow on the fantasy bandwagon, but we've been "tipping" winners for years. Usually there's money involved, unless it's a tipping competition run by a church leader!! In sharing these ideas I'm very dependent on the example of Barry Hume who's been doing this for years back in Tasmania. Since the NFL is about to kickoff their season it seemed like a good time to throw this out there. 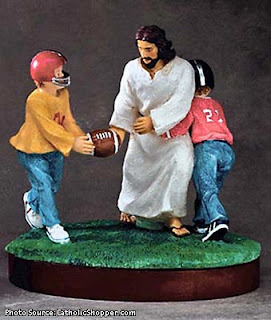 So here are some suggestions for using Fantasy Football to connect with guys one the periphery of the church. The goal of each of these suggestions is to use sports as an excuse to get to know people better. You can use all these suggestions to strengthen bonds between members, and that's great, but it won't be evangelistic unless the unchurched are involved. Use your imagination when inviting people to your league. Perhaps the unchurched husband of your members would like to get involved. Have you met a guy at the local diner or coffee shop who might like to get involved? Make sure you have a draft party. I know most drafts can be done on the computer, but remember the goal is face-to-face time. So take the time to get together and write it out. It's more work, but it will be worth it. Maybe use the church building or even better for building relationships would be using someone's home. As commissioner work hard to keep the emails and online comments (trash talk) going throughout the year. It's so easy to just let the league run on auto pilot. Community will only be built through intentional interaction. Do you have a church Christmas party or special event you can invite the unchurched participants to attend? Develop a list of awards so everyone still has an interest in participating. Have a vote for the most creative team name. Keep track of the biggest win by an underdog. Highest and lowest weekly scores over the course of the year. Team with the most injuries. Team with the most single digit losses. Have physical trophies for the winner, runner-up, and maybe consolation winner. This will provide continuity from year to year. You could even have a plaque somewhere in the church if you want to go all out. You MUST have an end of season awards night. Bring everyone together and eat lots of guy food. Plan to watch a final or the Superbowl together. Many people have standing plans for the Superbowl, but it could work great for an earlier playoff game. NEVER have a league prayer meeting for your fantasy teams!!! Did I need to include that? If you can apply most of these suggestions, there's a very high likelihood that you'll know these guys a lot better at the end of the season than the beginning. Only God knows where that relationship will go from there. I'm always looking for additional ideas, so please leave a comment if you have any.